Now… more than one hundred and seventy years ago, south of Watkinsville, Georgia, was the small but thriving antebellum town of Salem with a church, shops, offices, hotels, a tannery, and a boarding school. But, it vanished. Celestea Sharp set out find out about it…This article, which first appeared in Athens Magazine, August 1990, continues below with exclusive permission to the Thrasher Family Association…somewhat edited, abbreviated and updated for our website. Thank you, Celestea for your family detective work! I had moved from New York City and was new to Athens. I barely knew of Watkinsville, and I’d never heard of Farmington, much less Salem. In the mood for exploring one day, I drove to Watkinsville and followed some of the roads around it. Along the way, I began to notice some unexpectedly familiar names on street signs: Thrasher Street, Elder Covered Bridge, and the town of Bishop. Over the next few months, I wandered down roads in and around Watkinsville, thinking how interesting it would be to find the grave of that other “Mary Celestia Bird” four generations back. When visits to Watkinsville cemeteries turned up nothing, I drifted south down Highway 441 to Farmington. An older Farmington resident, sitting in his yard swing across from the town’s post office, responded to my questions by sending me down Salem Road to ask the last surviving Thrasher in the area. Meeting this distant relative was the breakthrough I had been looking for. Having lived in the area for 70 years, my newfound cousin knew immediately where I needed to go, and he took me there. Thus, my nonchalant rambling ended up bringing me face-to-face with my great-great-grandmother’s tumbled-down gravestone, in a small cemetery lost in the brambles and pines off a country road. When we lifted the heavy marker from the ground, and I read what was carved on it, I was overwhelmed with a feeling of connectedness. A feeling of legitimate belonging which my growing up in Atlanta, among other transplants, had never given me. And having found this first tangible trace of the family roots I’d never known, I was hooked, and had to learn more. Gradually I discovered that my family, beginning almost 200 years ago, had been residents of a thriving town called Salem, Georgia. In antebellum days Salem had been one of the three most important settlements in what was then Clarke County – the other two were Athens and Watkinsville. But in the decades after the Civil War, the town died and very little remains of it today. My Thrasher cousin drove me to the site of the old town. There on each side of Salem Road, 11 miles south of Watkinsville in lower Oconee County, stand only two buildings from a bygone era marking the location. One, across a wide field, a small clapboard church sits alone, starkly white against a background of dense forest. Its simple, clean lines and sharply pitched roof are reminiscent of a New England Shaker church or a Quaker meetinghouse. Tightly closed, dark green shutters on the windows give it an abandoned feeling even though its well-maintained appearance indicates attention by someone. To the left of the church lies its cemetery, and behind the church, three long granite-slab tables, probably used for church suppers under an ancient oak. On the other side of the road but like the church, not quite facing the road is a structure known as the “Brown House.” Its sprawling wood frame is unpainted, and the tin roof, which shelters the porch across the front of the house, has rusted to a red clay color. A small, dilapidated wood-frame building next to the road in its front yard is overgrown with vines. Although no professional historian has written in-depth about Salem, Georgia, I found several helpful sources of information as I began my quest in earnest. At the Northeast Georgia Regional Development Center in Athens, I found historic preservation planner William Moffat, who gave me an overview of possible historical sources and the important news that an historic plat map of the one-time town could be obtained from the State Archives in Atlanta. A book by University of Georgia professor Ernest C. Hynds, Antebellum Athens and Clarke County, Georgia, offered the best published collection of data about Salem. In addition to consulting three volumes written on the Thrasher family in Georgia, which I found at the University of Georgia Library’s “Georgia Room,” I also searched through back issues of Watkinsville’s weekly newspaper, The Oconee Enterprise. Here, I came up with histories of Salem written by local amateur historians, Robert Ashford in 1931 and Jerry Pope in 1974. In the newspaper, too, I found a 1951 history of Oconee County’s Salem Methodist Church by a member of the congregation, Mrs. Albert Hale. Finally, a dip into US Census records at the UGA library and into the 19th century deed books in the Clarke and Oconee County courthouses yielded some interesting facts. From all these sources, I pieced together a picture of Salem as a pioneer town, built around a natural spring and established on land purchased from the Cherokees by a family named Hester. Although Salem was not incorporated until November 1818, settlers had been streaming into the area since the end of the Revolutionary War. Indeed, quite a few of them were veterans of that war, responding to offers of free land from the new government. Several sources relate that most of the arriving people were of Scotch-Irish stock, descendants of those who settled and farmed the valleys along the Appalachian mountain chain from Pennsylvania south to Georgia. The largest numbers of them seem, like my family, to have come directly from North Carolina and Virginia. From the town’s beginning, Salem residents made their living almost exclusively from agriculture. And while they raised livestock and grew foodstuffs for personal consumption, the crop they planted in increasingly larger amounts from the 1820’s until the Civil War was cotton. With the dramatic increase in cotton cultivation came an equally dramatic rise in the number of slaves brought into Salem and into Clarke County as a whole. Hynds states in his book that five-sixths of the 1400-person increase in the county’s population between 1820 and 1830 were slaves. And I noticed that in the 1850 census figures for Salem, the town’s 22 free, white households owned 183 slaves. Ashford also reports that there were “two hotels in town, and several boarding houses” as well as “seven bar rooms conveniently located on the principal street.” He goes on to talk about the stagecoach coming from Madison, Georgia, which stopped at Salem to allow the horses to feed and rest themselves before continuing to Watkinsville, Athens and other towns on the route. According to George G. Smith, writing in 1900 in the Story of Georgia and the Georgia People, Clarke County in the early 1800’s “has in it many stills and made much brandy and whiskey…and the records of the county show that the inhabitants were by no means total abstainers…” Thus, if Salem was typical of the rest of Clarke County at the time, its seven bar rooms, with local trade bolstered by the patronage of stagecoach passengers, probably did a lively business. Perhaps the most interesting of Salem’s enterprises was the Salem Academy, established under the auspices of the Methodist Church in 1820 and incorporated in 1821. A boarding school for boys and girls, the academy probably offered courses such as English, a modern foreign language, Latin and Greek, arithmetic, science, history and geography. Painting and music were, we know, offered for a small additional fee. Hynds notes that in 1838 Salem Academy had an enrollment of 54 students, 30 males and 24 females. He also reports that a Farmer’s Academy was incorporated in 1837 and had an enrollment of 63 students in 1838. 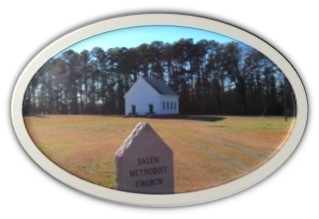 The only living link with Salem’s early history is the Salem Methodist Church. Mrs. Albert Hale’s 1951 history of the church states that in 1820, “A group of people in this town realizing the need for a place of worship organized a Methodist church. 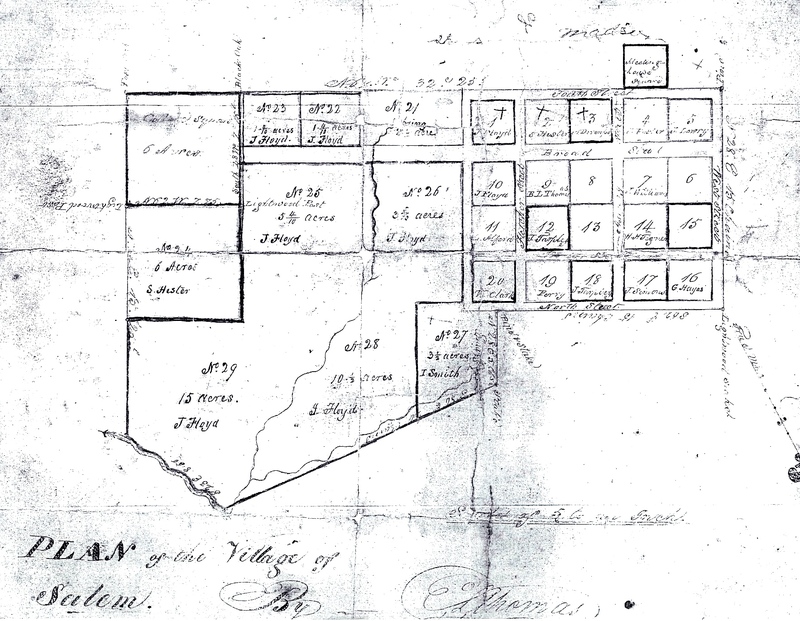 Samuel Hester and Elizabeth deeded the land consisting of nine-tenths of an acre for the sum of $1.00 to the trustees…” In 1822 the Hesters also deeded a parsonage to the church, but the parsonage had disappeared by 1850. From the outset, the preachers were Methodist circuit riders on the Watkinsville circuit. Because so little has been written about Salem, I decided to speak with a number of the older residents who still live near Salem today. What they told me helped link the scant historical accounts I had found with the few landmarks that remain. And it helped me understand why Salem lost its vitality after the Civil War and died by the time of the Great Depression. She also told me that she remembers the remains of the stagecoach station near the “Brown House.” “The old stables were tumbly, but they were still used for mules when I was a child.” And her father had taken her to see the remains of the tannery, which had ceased operating before she was born. Other residents of the area supplied interesting details about the site of Salem. Since her parents lived in the “Brown House” for years, Viola Carson was able to describe how her father, Jasper Harvey, had allowed the road builders to cut off a section of his front yard to straighten out a meander in the road – which explains why neither the “Brown House” nor the Methodist Church faces Salem Road exactly. “People have called my father’s house the ‘Brown House’ because of the color it was painted, the ‘Hester House’ because of the Dr. Hester who lived in it so long ago, and the ‘Inn’ because that place was a stagecoach stop,” Carson told me. She is uncertain of the house’s age, but Moffat estimates that it dates from the 1860s. My question about why Salem vanished was answered in two ways by Grace Collier, a knowledgeable Oconee County resident, and by Beryl Graves. “Salem was bypassed twice by the railroad,” stated Collier (first about 1840 and later around 1890, I discovered from other sources). A clue from a 15-year-old Thrasher family history – that a Florine Thrasher owned the Salem Academy bell because her family had acquired the Academy lot – had put me on alert for this name in my conversations with Salem area residents. When one of them mentioned that Ray Middlebrooks, her longtime neighbor, was Florine Thrasher’s son, I knew there was a good chance that I had found the bell. Until this discovery, I felt I had probably learned everything about the world of my ancestors that my time and energy would allow me to uncover. All the details I had unearthed about my family had left me with a satisfied feeling, a feeling that I knew myself better because I knew who they were. 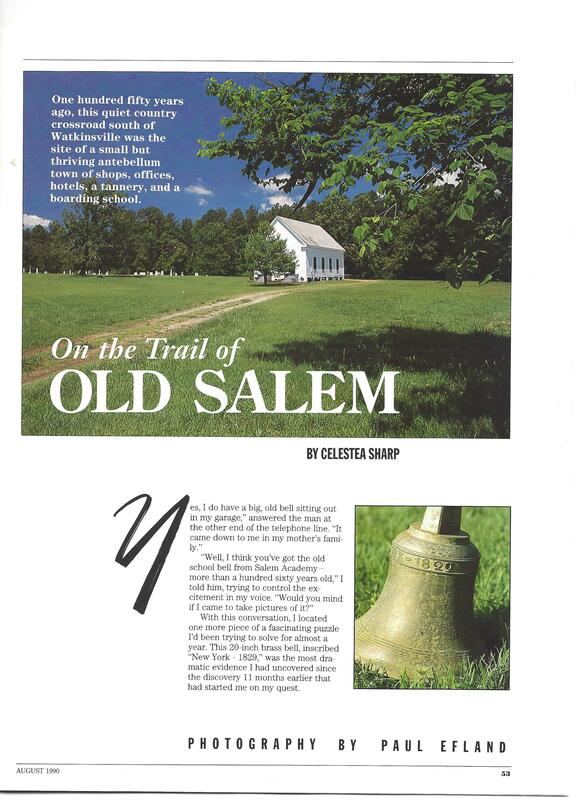 But the thrill of seeing the bell, like the thrill of seeing my great-great-grandmother’s grave, may keep me on the trail of Old Salem for some time to come. 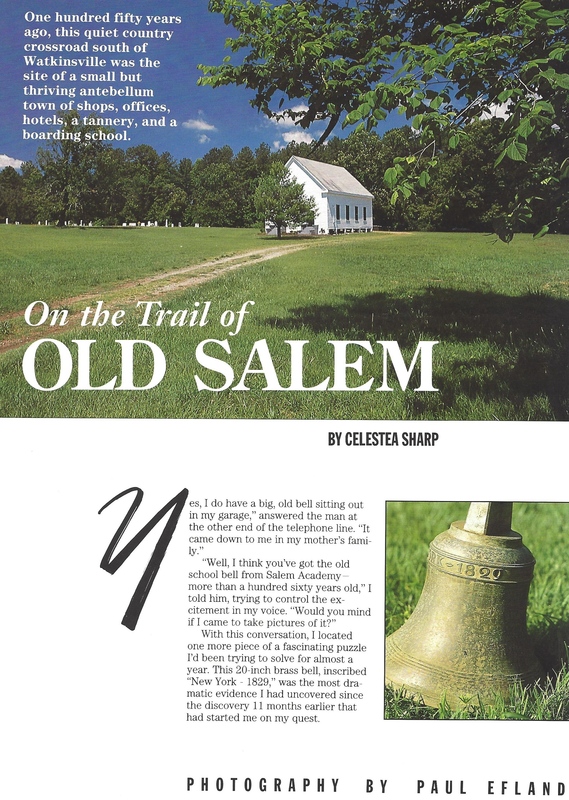 In April 2013 the Thrasher Family Association held its annual reunion in Athens, Georgia, and a large group went to visit the site of Old Salem and the Salem Methodist Church in Watkinsville. Mr. Albert Hale, who remembers many members of the church, lovingly takes care of it today. The pews were freshly polished and the grounds were well-kept. Friends and members of the Thrasher Family Association are invited make a donation to the “Salem Perpetual Care Fund” and mail it c/o Stephanie Wright, 2511 Watson Springs Road, Watkinsville, Georgia 30677. Thanks so much for this great information! I found an ancestor on the 1820 census (Moses Watkins) and have known very little about him. Apparently he also obtained land in the 1830 Cherokee land lottery. I will have to drive to ‘Salem’ soon and look around. Thank you so much for this! I am a young thrasher descendent attending college at the University of Georgia and knew my family was from there but didn’t know much about the influence of my family until a family reunion we had there in 2013! I had never heard of Salem until I found ancestors including my great-great grandfather, Isaac Gearreld (had been Fitzgerald), listed in the 1820 census. His family and several Fambroughs, who married into the Gearreld family, moved to Coweta County(where I live) in the 1850’s. Thanks so much for this information. It was such a delight to see the article about Salem Academy. I have a needlework sampler made by my great great grandmother, Sarah Alexander, who was a 16 year old student at Salem Academy in 1821. It shows her rendition of the brown 3 story building and lists the names of Sarah Clark and M. Graves on it. I had no information about the academy until I saw this article. I like to imagine that she may have rang that old bell occasionally. Thank you so much. Would love to see and image of your sampler, I’ve heard a couple of lectures on historic samplers that have given me a strong appreciation for them. Was just out to the old church today & saw a tombstone dated 1829. It’s incredible that such a sizable town was once in such a rural locale. My 3rd Great Aunt, Elizabeth Greenwood who married Samuel Hester. Thank-you so much for this lovely article. I will have to drive by the old house sometime soon. This answers some more questions on my quest to locate everyone. Thank you again for sharing. Haven’t done research on Elizabeth Greenwood as yet, but she is my 3X Great Grandmother. Her daughter Ann Hester Hester was my 3X Great Grandmother, and gave me fits in understanding that she married her cousin Joseph W. Hester in Salem, GA 1825. What a find – looking for details on Salem Georgia from genealogy research for a driving trip this summer, and now I have a place to visit!!! Elizabeth Greenwood and Samuel Hester are my 3x Great Grandparents and I hope to gain more information in New Kent, VA on my 7x Great Grandparents Francis Hester born there in 1650 and his wife Elizabeth Garland. Samuel Hester’s daughter Ann Hester Hester’s father-in law Stephen W. Hester also shows on 1820 census of Salem GA . For several generations Hesters married cousins, which makes for a challenge in research. If anyone knows of Mary Ann Few who married Thomas Hubbard and sold family land in Salem, GA to Hesters, I love to understand that story. Her sister Caroline Few married someone named Joseph Th??? ?, could it be Thrasher? Mary Ann Few left her family and lived with her sister in Oglethorpe GA until she was 99. Thanks for the connect with some of my Hester Texas relatives too, although I live on the Brazos River now I still have fond memories of Hester of Gonzales County,Texas. The Beryl Graves that you spoke with, I believe, was my 2nd Cousin, twice removed…a daughter of Joseph Walter Graves. Are you related to a John Williams Graves who married a Martha Hinton, both from NC and living in Salem before 1833. In the 1930 census, I find a family of Osbands (John T. and Lettie) who lived in Salem; however, there is no record of them before or after 1930. I’m thinking the census taker got the last name wrong. Are there any records, other than the census, of people living in Salem in 1930? Does anyone know if there is a listing of the burials in the cemetery? My 3x great grandmother died in Salem, GA in 1833. I have been looking for her grave for at least ten years now. Her name was Ann E Williamson, she moved to Salem in 1814 according to her obituary, she was the widow of James Williamson and was from Caswell County, North Carolina. She and four of her children lived in Salem where she attended the Methodist Church. Any information on the cemetery would be wonderful as I live in North Carolina.